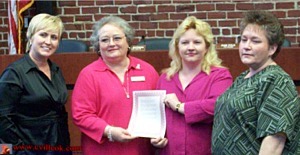 L-R: Pam Polk, Bilie Fullbright, Vickie Thompson and Pam Porter hold the City's Relay For Life Proclamation in support of the May 15th event.. The Collinsville City Commission met Monday Mar. 16th (at the City Hall Community Room, 106 N 12th Street) for the 7pm regular Municipal Authority & City Commission meetings. 3. Roll Call: - all present except Mayor Sallee. Vice Mayor Porter conducted the meeting. A. Approval of Claims in the amount of $21,545.37. B. Approval of March # 1 Payroll in the amount of $38,888.32. C. Approval of Minutes of the March 2, 2009 Regular Meeting. D. Supplemental Appropriation in the amount of $225.00 for reimbursement of monthly bank fees. E. Approval of Cemetery Deeds for: Louis or Billie Arney, 2 spaces; R.A. Cottingim, 4 spaces. 6. Discussion, consideration and possible action to approve Relay for Life City of Hope Proclamation. -- approved (see photo above). The proclamation is in favor of the May 15th (7pm-7am) cancer research fundraiser at Owasso's HS track. 36 teams have signed up so far. The event raised $125K last year. (similar coverage 2003 ). * The city received their new small bucket truck recently but it was sent back due to several missing parts. The person delivering the bucket truck (after the parts were added) apparently hit a deer in transit resulting in ~$4500 in damages. The bucket truck is back in Collinsville but in the shop here for repairs due to the deer collision. 2. Roll Call: -- all present except Mayor Sallee. A. Approval of Claims in the amount of $207,119.48. B. Approval of February # 2 Payroll in the amount of $21,402.90.